We are very pleased that individuals with mobility challenges, are hearing impaired, and have other disabilities finally have access to our programming and activities, whether as actors or audience members, now that we are in our new, ADA-compliant facility. Through our efforts over the past year, there has been a significant increase in awareness of our accessibility efforts (and their importance) within the staff, cast, crew, and volunteers, within the Near West Theatre community, and within the disabilities communities in Greater Cleveland. Read some audience and cast testimonials from our Sensory Performance of Joseph & the Amazing Technicolor Dreamcoat HERE. Accessible seating is available for all of Near West Theatre’s productions. The entire first floor of the theatre is accessible and the entire first row of seats in the house are accessible seats, unless stated otherwise. Our General Admission tickets are are now AUTO-ASSIGNED, our ticketing system assigns these seats based on the best avaiable seating at the time of purchase. People with mobility disabilities who require accessible seating due to their disability MUST call the Box Office to discuss accessible seating options. This group includes people who use wheelchairs, those who use other mobility devices, and people who cannot climb steps or walk long distances due to significant arthritis or severe respiratory, circulatory, or cardiac conditions. Patrons who need accessible seating in the front row are allowed to have one guest sit next to them in the front row. - If you or a member of your party require accessible seating please call the Box Office at 216-961-6391 or visit the Box Office at 6702 Detroit Ave. Cleveland, OH 44102 to purchase your tickets and discuss your accessibility needs. If you have already purchased your General Admission tickets online please call us to discuss your accessibility needs. - If you or a member of your party needs accessible seating and you’re purchasing General Admission tickets ($10 for adults, $8 for children twelve and under), the Box Office staff will reserve where your seats will be located. If you purchase a Reserved Star Seat for, you will be able to choose where your reserved seat will be located. - If you or a member of your party has to stay or would like to stay in their wheelchair or mobility device during the performance, please let us know by calling the Box Office at 216-961-6391 so we can discuss your accessible seating needs. To learn more about ADA ticketing guidelines please feel free to visit http://www.ada.gov/ticketing_2010.htm. Near West Theatre does not have a dedicated lot in the Gordon Square Arts District. However, there are several accessible parking spaces close by. The lot behind our theatre has one accessible spot. There are also several accessible spaces in the public that sits between W. 67th and W. 65th, behind The Detroit Arcade/The Capitol Theatre. These spots are closer to W. 65th street but give you better access to sidewalks. There are also a few accessible spaces on the street, specifically W. 67th and Detroit Ave. For a more detailed map of parking around the area please visit our Directions & Parking page. - If you or a member of your party needs to be dropped off at the front of the theatre we suggest turning north on W. 67th, a one way street, from Detroit Ave. and drop off any patrons there. You are also welcome to pull into the parking lot directly behind our theatre and drop any patrons off there before finding parking. 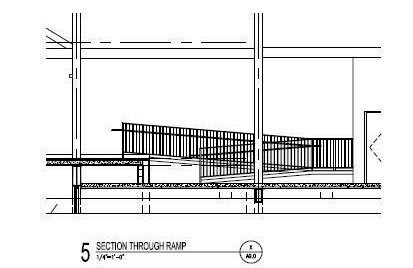 Dropping off in the parking lot will allow easier access to the sidewalk, but there is a slight hill to get up to the front entrance of the theatre. - If you have a questions about drop off locations or accessible parking, please give our Box Office a call at 216-961-6391, open Monday-Friday from 11am-4pm. Hearing Assistance devices are available at each performance. - If you are in need of a hearing assistance device, you can request them at the Box Office/Will Call when you pay for or pick up your tickets before the show. In order to receive a hearing assistance device we’ll ask patrons to provide their driver’s license or State ID to the Box Office for the duration of their use of the device. Their driver's license or State ID will be returned to them when the device is brought back at the end of the performance. There are a limited number of devices available. Please make sure to ask early if you require one. - If you or a member of your party requires a noise canceling device, which can be used to cut down the noise of the show, you can request them at the Box Office/Will Call when you pay for or pick up your tickets. These often help children or people on the autism spectrum who might be overwhelmed with the noise of the performances. Through our partnership with The HeArd we are pleased to provide one ASL Interpreted Performance during our season. Please call the Box Office at 216-961-6391 for information on when this performance will occur. - If you or a member of your party are in need of an ASL interpreter for one of our performances that’s not our performance with The HeArd we ask that you call a month in advance so arrangements can be made. Please call the Box Office at 216-961-6391 to make those arrangements. If you require audio description for one of our performances we ask that you call a month in advance so arrangements can be made. Please call the Box Office at 216-961-6391 for information on audio descriptions, if you have questions, or require an audio description for the performance you plan on attending. Sensory Friendly Performances are performed in a friendly, supportive environment for an audience of families and friends of people who are diagnosed with an autism spectrum disorder, other sensitivity issues, or other disabilities. There will be slight adjustments to the production, including reduction of any jarring sounds or strobe lights focused into the audience. Also, there will be quiet spaces and activity areas set up in the theater lobby for those who need to leave their seats during the performance. Tickets for these performances are available for children and adults on the autism spectrum and their friends and family, as well as those with other disabilities or sensitivity issues that need a friendly audience environment. Only General Admission tickets will be available for these performances. You can purchase tickets by calling our Box Office at 216-961-6391, open Monday-Friday from 11am-4pm. ONLINE SALES NOT AVAILABLE FOR THIS PERFORMANCE. PLEASE CALL THE BOX OFFICE. Contact Amy Clausen at 216-961-9750 or aclausen@nearwesttheatre.org with any questions about our Sensory Friendly Performances, and please call the Box Office at 216-961-6391 for information on when this performance will occur. Read some audience and cast testimonials from our Sensory Performance of Joseph & the Amazing Technicolor Dreamcoat below. We now have a built-in accessibility ramp from the floor of the main auditorium to the proscenium stage. From the audience’s perspective, it is at the front right-hand side of the auditorium (stage left). In order to fit and not be too steep, it consists of two parallel sections with a turn-around landing between them. Thanks to a gift from donors Mort and Iris November, an elevator now serves our lower level, lobby and balcony. The elevator was dedicated to Mort’s daughter, Debra Ann November. Iris was also eager to sponsor the elevator because of her daughter, Anita Hollander. Anita is an actress in New York City who is a disabilities rights activist and regularly performs her original solo musical, Still Standing: A Musical Survival Guide for Life’s Catastrophes. This play won the United Solo Festival Audience Award in NYC. As a result of an April, 2015 tour we hosted for representatives from agencies serving persons with disabilities, we learned many ways in which we can enhance our disabilities services, and that we have many colleagues in the field eager to partner with us as we grow in our capacity. The latter two advised us as we learned how to provide a Sensory Friendly Performance for those on the autism spectrum. We implemented our first Sensory Friendly Performance during our Fall 2016 production of Joseph & the Amazing Technicolor Dreamcoat. We are striving to host more such performances very soon.